Tom Izzo enriches the Michigan State basketball program's history with season awards named for former players and coaches. It is one way the Basketball Hall of Fame coach connects the past to the present and into the future. 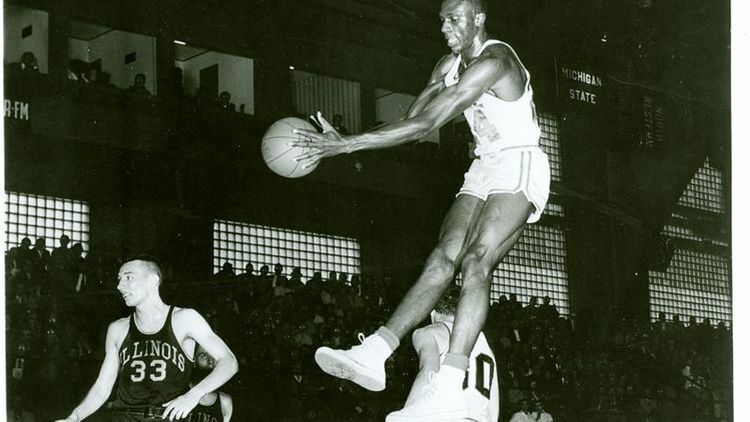 Johnny Green, who led the Spartans to their first Final Four in 1957 while averaging 13.2 points and 14.6 rebounds a game (16.9/16.4 for his career), has expressed in the past how much it has meant to him that Izzo named the team rebounding award in his honor: “The Jumpin’ Johnny Green Chairman of the Boards Award. “I appreciate Coach Izzo for the award and the respect I have received from the fans when he has brought me back for a game ,” Green told me when the Michigan State made the 2015 Final Four. Other team awards include the Antonio Smith Glue and Guts Award and Tim Bograkos Walk-On Award. Smith led Izzo's first Final Four team in 1999. Representing former coaches are the John E. Bennington Defensive Award and the Gus Ganakas Most Valuable Player Award. Well, the Spartans are back in the Final Four this weekend as Michigan State (32-6) plays Texas Tech (30-6) at approximately 8:49 p.m. Saturday in Minneapolis. The program Izzo has built is the blue blood in this foursome, with Virginia (33-3) meeting Auburn (30-9) at 6:09 p.m. in the opening semifinal. Since this year’s MSU Final Four roster includes a player that committed to Michigan State with school passion similar to Earvin "Magic" Johnson four decades ago, it makes me wonder if thought should be given to another award named for a player -- or players. Something like the Kenny Goins Green and White Passion Award or the Goins-Magic Green and White Passion Award. What makes Goins’ Michigan State commitment unique was his willingness to walk-on as his only path out of high school to wear the green and white. He passed on mid-major scholarship offers to walk-on with the Spartans in the 2014-15 season. Johnson had the same attitude when he committed to Michigan State. He grew up in Lansing a Spartans fan and bonded with then-MSU coach then-MSU coach Gus Ganakas at Michigan State summer camps. He never would have considered another school if Ganakas had not been fired in the spring of his junior year at Lansing Everett. That's what opened a national recruiting door that didn't close until new coach Jud Heathcote earned Magic's trust and Ganakas assured Johnson Michigan State was still the right place for him. Two years later Johnson led the Spartans to the 1979 NCAA title. Maybe I'm naive, but I’ve always wondered why so many recruits have such a hard time committing to a college. Maybe recruiting is too sophisticated now, with kids pondering all the angles of where they fit into a coach’s scheme. Other kids fall for slick recruiting pitches of John Calipari or Rick Pitnino or they view a certain college coach as the best launching pad to the NBA (read: Calipari and Pitino). I wasn't a Division I athlete, but the only school I applied to was Michigan State. With that frame of reference, maybe I was spoiled as a Michigan State student writing for the State News the afternoon that I attended Magic's press conference at Lansing Everett. “Once you have that green and white in you, you never lose it,” Johnson explained of his dream to lead the Spartans to a national title. Don’t more kids grow up a fan of a school like Goins and Johnson? Maybe there are, but we don't hear about them. In addition to Goins, another players I came across is North Carolina's Luke Maye. The senior from Charlotte (N.C.) Hough turned down scholarship offers from ACC members Notre Dame and Clemson to fulfill his dream of playing for the Tar Heels. As a sophomore, he hit a three-point field goal to beat Kentucky in an Elite Eight game. A week later North Carolina won the national championship. That brings us back to a possible Goins-Maye parallel that the Spartans can complete with a national title. Goins hit a three-point field goal in the final moments of Sunday's East Regional final to lift Michigan State past Duke 68-67 and into the Final Four. Goins' road to this year's Final Four began as redshirt his true freshman season. His goal was work hard on the scout time and use his time to mature physically and develop techniques. He was was listed as a 6-foot-6, 215-pounder in 2014-15 but was 10 pounds heavier while playing in 2015-16 as a redshirt freshman. His year-by-year minutes, points and rebounds were steady if unspectacular: As a redshirt freshman, 10.2, 2.0, 2.9; redshirt sophomore, 18.3, 3.4, 4.5; and fourth-year junior, 13.9, 2.1, 2.8. As 6-7, 235-pound redshirt senior, he was ready for playing time that opened up when Mile Bridges and Jaren Jackson Jr. both declared for the 2018 NBA Draft. This season he has started 38 of 38 games, 30.3 minutes per game, 8.1 points and 9.0 rebounds. He scored a career-high of 24 against Nebraska, tied a school record with eight blocked shots against Indiana and recorded 16 10-plus rebound games. Perhaps most important, he was able to play defense on Duke's 6-7, 285-pound Zion Williamson, this year's Zeus of college basketball. The great Jim Murray, a Pulitzer Prize winner for the Los Angeles Times, labeled Michigan State's 1965 national championship football team that advanced to the Rose Bowl the Jolly Green Giants. These basketball Spartans, with Goins in the middle of it all, became the Jolly Green Giant Killers. Izzo commented earlier this year on Goins' remarkable transformation from the fall of 2014 to the spring of 2019. Goins said his parents, Ken and Laura, were prepared to pay for his whole career at Michigan State to allow him to fulfill his dream. But after his scout team season Izzo called him into his office to meet with him and his assistant coaches. Until the meeting was over, that is, and he walked outside to the plaza at the Breslin Center. What a fitting place to feel his joy of relieving financial pressure from his parents and living out his green-and-white passion.